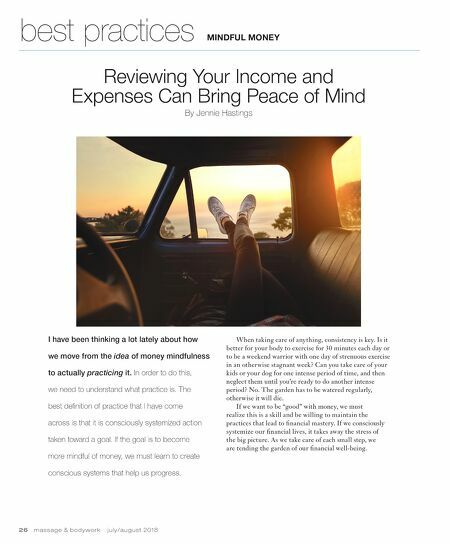 26 m a s s a g e & b o d y w o r k j u l y / a u g u s t 2 0 1 8 MINDFUL MONEY best practices Reviewing Your Income and Expenses Can Bring Peace of Mind By Jennie Hastings I have been thinking a lot lately about how we move from the idea of money mindfulness to actually practicing it. In order to do this, we need to understand what practice is. 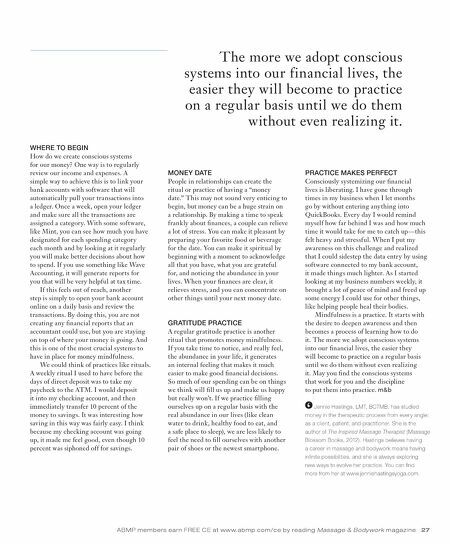 The best definition of practice that I have come across is that it is consciously systemized action taken toward a goal. If the goal is to become more mindful of money, we must learn to create conscious systems that help us progress. When taking care of anything, consistency is key. Is it better for your body to exercise for 30 minutes each day or to be a weekend warrior with one day of strenuous exercise in an otherwise stagnant week? Can you take care of your kids or your dog for one intense period of time, and then neglect them until you're ready to do another intense period? No. The garden has to be watered regularly, otherwise it will die. If we want to be "good" with money, we must realize this is a skill and be willing to maintain the practices that lead to financial mastery. If we consciously systemize our financial lives, it takes away the stress of the big picture. As we take care of each small step, we are tending the garden of our financial well-being.